The sad news keeps coming. 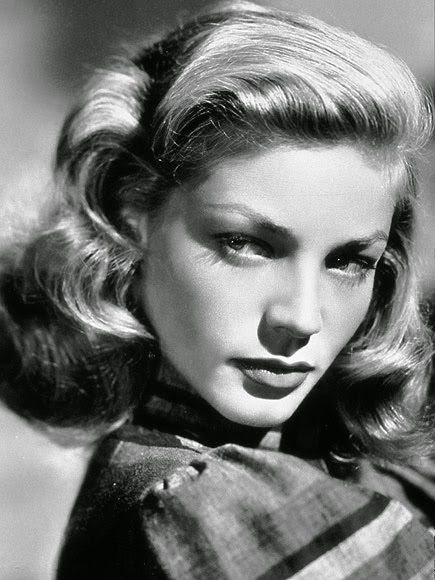 Lauren Bacall, née Betty Joan Perske, a salesman's daughter who became one of the pre-eminent women of Hollywood in the middle to late twentieth century, died today of a massive stroke at the age of 89. As a boy and young man, I was entranced by her combination of toughness and tenderness, which she shared with another favorite of mine, Katherine Hepburn. The video above shows her displaying both qualities, playing opposite her frequent film partner and later husband, Humphrey Bogart, in To Have and Have Not (Howard Hawks, 1944), based on a novel by Ernest Hemingway. She was nineteen years old when she was cast for this part. As most, if not all, of you know by now, Robin Williams died today. The photo at left, by Photographer's Mate Airman Milosz Reterski (Navy NewsStand) [Public domain], via Wikimedia Commons, was taken while he was "entertain[ing] the crew of USS Enterprise (CVN 65) during a holiday special hosted by the United Service Organization (USO)." 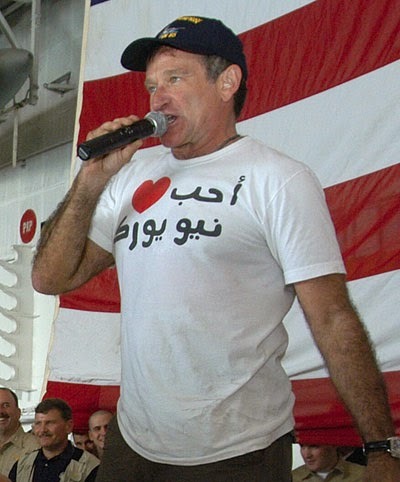 His shirt says "I [heart] New York" in Arabic. I'm late on this sad news, but my friend, fellow Brooklynite, fellow Episcopalian, and fellow blogger John Wirenius has a very good post, with two superb videos. You can read it here. In the late '70s or so, Mom came down to NYC, where Doug and I took her to the Improv comedy club on her birthday, December 28. After a few comics, a sudden roar greeted the surprise appearance of Robin Williams, and I believe that during his hilarious set while riffing on birthdays, I pointed to Mom and he acknowledged it. During the last few years, I had numerous private as well as small group discussions and laughs with Robin, mostly at/near 142 Throckmorton Theatre in Mill Valley, where he often did sets and improv for fun, allowing and encouraging others to shine too. He often sat in back, spurring younger stand ups with his barking laugh. On one such occasion, a couple shyly interrupted our conversation near backstage for a joint photo on their wedding night. Happy to oblige, he told them each: "Pretend to be surprised tonight!". Only a few months ago, Robin and I walked yakking alone for two blocks to a restaurant after the Tuesday Night comedy show, discussing his Broadway show, NYC apartment and so forth. He headed the table of comics and others, and asked me to sit down next to him. For 45 minutes or an hour, we had coffee, a bite to eat and conversation. He had grown up and lived nearby, and had struggled with everything from heart surgery, depression, substance abuse and domestic challenges, usually working frenetically while remaining accessible and friendly. I saw him do a very edgy, riotous set recently and a couple of generous improv sets with rookies; when asked how he would like to be greeted in heaven, he said he hoped that he would have a front row seat and God would say "Two Jews walk into a bar . . .". Etc., etc. Many if not most comics seem to have depressive personalities, from which paradoxically the humor explodes -- think of Jewish comics in the shadow of the Holocaust. He always leapt easily among standup, improv, comic and dramatic, serious acting, with some great movies that were not meant to evoke any mirth. It may be silly to reminisce through my little lens when he knew thousands of more important people better (everybody knew him and vice versa) but he knew my name and always said hello, and it is a good indication of the manner in which Robin affected so many.